Hey there! Are you guys ready to geek out over some design measurements?? Because anyone with a roof over their head could use a few of these for good measure. 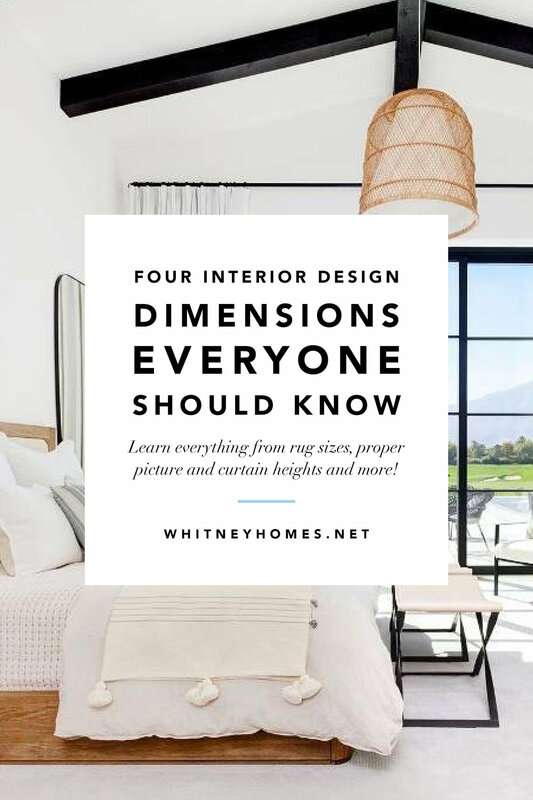 Did you know there are some interior design rules and guides that are universally aesthetically pleasing? Now, I know some of you like to break the rules, which of course I do too, but If you have a room that just feels “off,” some of the below rules and guidelines might be the perfect fix. 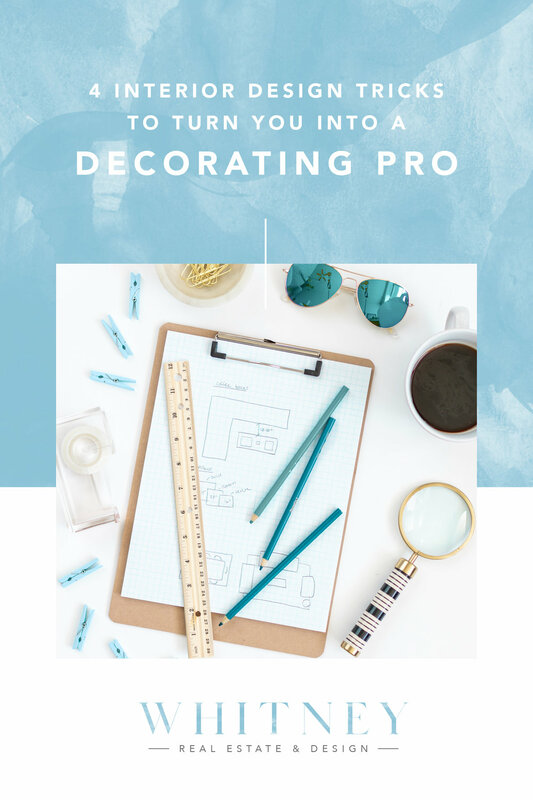 Read on to become instantly more knowledgable about how to make your house look and feel more proportional and aestetically pleasing! Ahh, the old question of where to hang the picture on the wall. I've noticed some people tend to hang photos too high or too close to the ceiling. When a photo is hung too high it makes your room look shorter than it actually is and throws off the proportions of the room entirely. The best rule of thumb for hanging photos is to hang them 57" on-center. 57" is average eye level and on-center means the very center of the photo frame. If you have a large focal piece (like in my photo) hang it 57” from floor on center then space out the rest based on the first photo. If you have relatively similar sized frames, start with the center frame at 57" on center and space the rest out from there. Gallery walls are all about proportions, so if you're decorating a wall with extra high ceilings or lower than average ceilings, you can fudge the 57" slightly higher or lower to make it look best on your wall. Also, when hanging gallery walls, the human eye naturally likes to see more "weight" at the bottom and lighter at the top, this aesthetic is found in nature all the time. So, when hanging artwork, keep in mind that hanging heavy/dark/large frames on the left and bottom is preferred. Darker colors should go closer to the left and to the bottom and lighter colors should be at the top and to the right side of your gallery wall. Your guests might not see that you did this on purpose, but will be sure to comment on how great it looks! See the photo of my living room as an example. what if I'm hanging my art above furniture? If you’re hanging frames above a sofa or credenza, you can hang your photos anywhere between 57”-66” on center depending on the height of the furniture and height of your ceilings. Typically the lowest frame should hang 4-8” above the top of the furniture, and the highest frame should be at LEAST 4” from the ceiling/moulding. If you're hanging curtains in your space, it's super important that you know how to measure and hang your curtains so they look proportional to your room. Curtains are a great way to make a short room feel taller, or on the flip side, a tall room feel cozier. You don’t want to hang your curtains too close to the window frame, and most people want to make their ceilings look higher so by hanging your curtain rods 6-12" above the window frame you will immediately elongate the room. If you're lucky enough to have high ceilings or just want to make a room feel even cozier, two-toned or color block curtains can help make a room with tall ceilings feel more intimate and help break up the long lines of tall windows. I love white or cream curtains with a navy, grey, or grey-blue block trim at the bottom. This will not only make your room look ultra-tailored, it's also a VERY easy DIY if you or someone you know has a sewing machine and knows how to work it! Rugs are the best way to ground your furniture and make a room feel cozy and complete. You want to avoid the look of "floating furniture" with the proper rug size. Best rule of thumb to measure the right size is to make sure that the rug touches the front legs of all of your furniture. If you have a particularly large room, with furniture floating in the middle of it, your rug can extend up to 18" behind your furniture. BUT be sure to allow for 12"-24" of bare floor from the edge of the rug to the wall to make sure it doesn't look like you tried to carpet your floor and just miss-measured by a few inches. Whatever you do, I repeat, WHATEVER you do, avoid the small "postage stamp" rug at all costs. This is a rug that is too small for the area and doesn't unify your furniture. Although a smaller rug might be cheaper, this will completely throw off the feel of the room, and instead of feeling cozy, your room will feel uncomfortable and unfinished. The ONLY place it's appropriate to have a "postage stamp" rug is your front doormat, your kitchen sink, and your bathroom. THATS IT! If you follow the guidelines below you can't go wrong when choosing a rug size. Are you ever scrolling through pinterest or walking through a house and everything is styled just SO beautifully? Well I bet they are following the rule of styling in threes. And you're in luck, because you're about to learn all the tricks to styling in threes! Items arranged in threes (or odd numbers) are often naturally more appealing to the human eye, than even numbered groupings. This also creates an aesthetically pleasing layered look, appearing casual yet tailored - a look that I'm always striving for! When styling shelves and tables, groupings of three are a no-fail way to make your shelf-styling looks beautiful and Pinterest-worthy. See below for a few rules on how to layer. These are just a few of the most common design dilemmas I see people encountering, and hopefully these tips will help you come a few check-boxes closer to making our house feel more like a home! These are just design rules of thumb to get you started. Every space is different so at the end of the day, do what feels and looks right to you. You do have to look at it every day after all! Tell me in the comments below if you have other "standard" design measurement questions or need any interior design rules further explained!